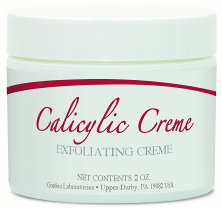 INDICATIONS: Aids in the exfoliation and softening of dry, scaly or calloused skin. DESCRIPTION: Calicylic Creme is effective as an aid in treating callous conditions, cracks and fissures, and rough dry skin. This is due to the action of an exfoliator (Salicylic Acid) and a moisturizer (Urea). Salicylic Acid exerts a marked keratolytic action as it breaks down or dissolves the dead, scaly skin in the layer of the epidermal tissues known as the stratum corneum; and thereby makes room for new tissue growth. Urea adds elasticity to the skin to make it supple by drawing upon the body’s own moisture. Known for both its hydration and keratolytic properties, Urea restores damaged skin to a normal radiant look. The cream base is specially formulated for the maximum topical delivery of the two active ingredients. DIRECTIONS: Massage into dry skin areas once or twice daily, or as prescribed by a Physician.